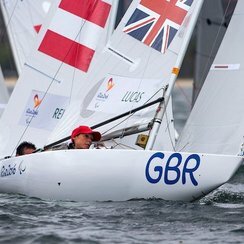 With each of the three classes contesting the 11th and final race of their series, Lucas consolidated her position as Britain’s most successful sailing Paralympian, adding Rio 2.4mR one-person keelboat bronze to London 2012, She trains at Weymouth and Portland National Sailing Academy. while Rickham and Birrell who train in Hamble replicated their feat from four years ago in the SKUD18 two-person keelboat class. Their success means that the British Sailing Team has achieved its pre-Rio target of two medals. 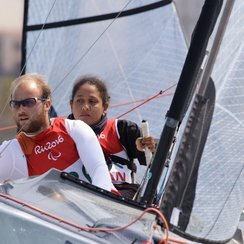 Rickham and Birrell, who finished today’s race in fourth, admitted they were elated with their medal after a close-fought battle for silver with the Canadian boat. Dan Fitzgibbon and Liesl Tesch (AUS) had already secured the gold medal yesterday. Having headed into today’s race in pole position overall, Lucas’ achievements were tinged with disappointment after she found her progress had been hindered during the race by a plastic bag on her rudder. France’s Damien Seguin ultimately took gold with Australia’s Matt Bugg claiming silver as Lucas crossed the line in 15th place. She said: “It was an absolute fight in the mix, I couldn’t break out or break free no matter what I did. I kept thinking I was doing the right thing and getting the shifts right but I didn’t have the speed I’ve had all week because I was towing a bag. He said: “It was good to finish on a high note, it just shows what we can do. The Wednesday when we got the three bullets was pretty awesome; there was a nice bit of breeze and we really got into.